Baron Sir John Henry Schroder was a distinguished collector who bought ‘The Dell’, in Englefield Green, near Egham in Surrey, during the 1880s. He extended the house, and lavished a great deal of care and attention on his gardens, where he grew grapes, peaches, nectarines and melons in a group of large greenhouses, which may possibly have been built by James Pulham and Son, because they were certainly responsible for the lovely rock garden that was built c1888. They are also likely to have been invited back c1913 to landscape another garden in the section of the estate that is now called ‘Oaklands’. 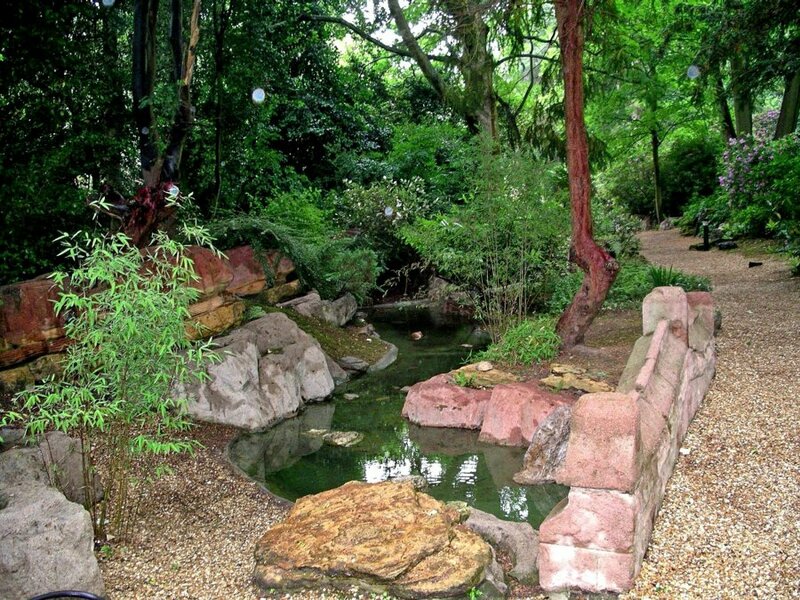 ‘The Dell’ rock garden is quite small, but absolutely charming, being formed around a rock-lined path that that meanders alongside am artificial stream. There is a large castellated water tower that holds the water that is pumped up from the neighbouring valley. A full description of the work done by James Pulham and Son at ‘The Dell’, Englefield Green – together with a number of pictures – can be found in Chapter 16 of Rock Landscapes: The Pulham Legacy – the critically-acclaimed and lavishly illustrated definitive story of the lives and work of James Pulham and Son. Written by Claude Hitching, with featured photography by Jenny Lilly. Published by Garden Art Press. Posted on August 31, 2014 June 26, 2016 by Claude HitchingPosted in Book ContentsTagged . . James Pulham and Son, Baron Sir John Henry Schroder, bridge, Claude Hitching. James Pulham and Son, Rock Landscapes: The Pulham Legacy, stream, The Dell - Englefield Green, water tower.